Confocal immunofluorescent analysis of HeLa cells labeled with MEK1/2 (47E6) Rabbit mAb #9126 detected with Anti-Rabbit IgG (H+L), F(ab')2 Fragment (Alexa Fluor® 555 Conjugate) (red, left) compared to an isotype control (right). Actin filaments have been labeled with fluorescein phalloidin (green). Blue pseudocolor = DRAQ5® #4084 (fluorescent DNA dye). 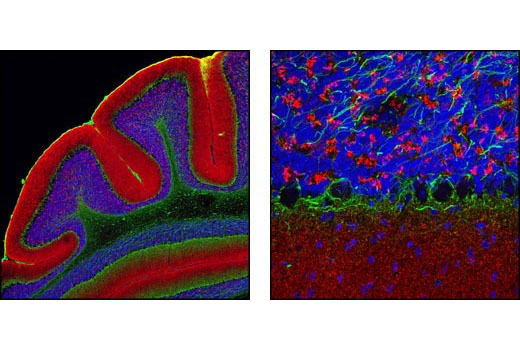 Confocal immunofluorescent analysis of mouse cerebellum using α-Synuclein Antibody (IF Preferred) #2628 detected with Anti-Rabbit IgG (H+L), F(ab')2 Fragment (Alexa Fluor® 555 Conjugate) (red) and Neurofilament-L (DA2) Mouse mAb #2835 detected with Anti-Mouse IgG (H+L), F(ab')2 Fragment (Alexa Fluor® 488 Conjugate) #4408 (green). Blue pseudocolor = DRAQ5® #4084 (fluorescent DNA dye). High content analysis of A549 cells exposed to varying concentrations of LY294002 #9901 for 3 hrs, followed by 100 ng/mL EGF for 20 minutes. 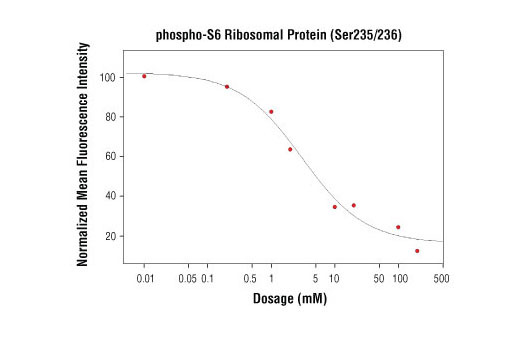 With increasing concentrations of LY294002, a significant decrease (~5 fold) in phospho-S6 Ribosomal Protein (Ser235/236) signal as compared to the uninhibited control was observed. When using phospho-S6 as a measurement, the IC50 of this compound was 3.06 μM. Data were generated on the Acumen HCS platform using Anti-Rabbit IgG (H+L), F(ab')2 Fragment (Alexa Fluor® 555 Conjugate). The optimal dilution of the anti-species antibody should be determined for each primary antibody by titration. However, a final dilution of 1:500–1:2000 should yield acceptable results for immunofluorescent assays. Supplied in 0.1 M sodium phosphate, 0.1 M sodium chloride, pH 7.5, 5 mM sodium azide. Store at 4°C. Do not aliquot the antibody. Protect from light. Do not freeze. Anti-Rabbit IgG (H+L) F(ab')2 Fragment was conjugated to Alexa Fluor® 555 fluorescent dye under optimal conditions and formulated at 2 mg/ml. This F(ab')2 fragment product results in less non-specific binding, as it lacks the Fc domain that can bind to the cells with Fc receptors. F(ab')2 fragments are prepared from goat antibodies that have been adsorbed against pooled human serum, mouse serum, plasmacytoma/hybridoma proteins and purified human paraproteins. 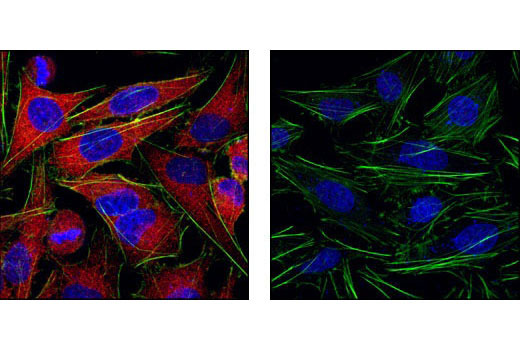 This product has been optimized for use as a secondary antibody in immunofluorescent applications. Fluorescent anti-species IgG conjugates are ideal for flow cytometry and immunofluorescence. Cell Signaling Technology’s strict quality control procedures assure that each conjugate provides optimal specificity and fluorescence. Acumen is a registered trademarks of TTP Labtech. The Alexa Fluor dye antibody conjugates in this product are sold under license from Life Technologies Corporation, for research use only for immunocytometry, immunohistochemistry, high content screening (HCS) analysis, or flow cytometry applications. The transfer of this product is contingent on the buyer using the purchased product solely in research conducted by the buyer (whether the buyer is an academic or for-profit entity), for Immunocytochemistry, high content screening (HCS) analysis, or flow cytometry applications. The sale of this product is expressly conditioned on the buyer not using the product or its components (1) in manufacturing; (2) to provide a service, information, or data to an unaffiliated third party for payment; (3) for therapeutic, diagnostic or prophylactic purposes; (4) resale, whether or not such product or its components are resold for use in research; or for any other commercial purpose. For information on purchasing a license to this product for purposes other than research, contact Life Technologies Corporation, 5791 Van Allen Way, Carlsbad, CA 92008 USA or outlicensing@lifetech.com.